I'm ending April with some fantastic biographies about poets! I've tried to celebrate poetry all month long by posting poetry on my school blog and by reading poems to students. I found these stories to be inspiring and thought they earned the right to be featured. How did you celebrate poetry this month or anytime? 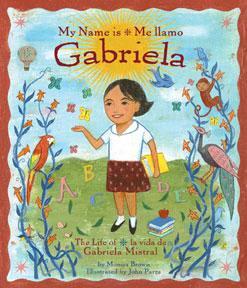 1) My Name is Gabriela; The Life of Gabriella Mistral by Monica Brown; ill. by John Parra (2005). Born in Chile, Gabriela had a vivid imagination and taught herself to read because she wanted to read stories not just hear them. She loved the sounds of words and wrote poetry, songs and stories as a child. Gabriela played school with her friends and little sister and made them learn their ABC's and later, she became a teacher as an adult. She worked hard and was able to travel, exploring and creating new stories along the way. She was the first Latin American writer to be awarded the Nobel Prize for Literature. This book contains beautiful illustrations and a happy young Latina charater with an early love of language! 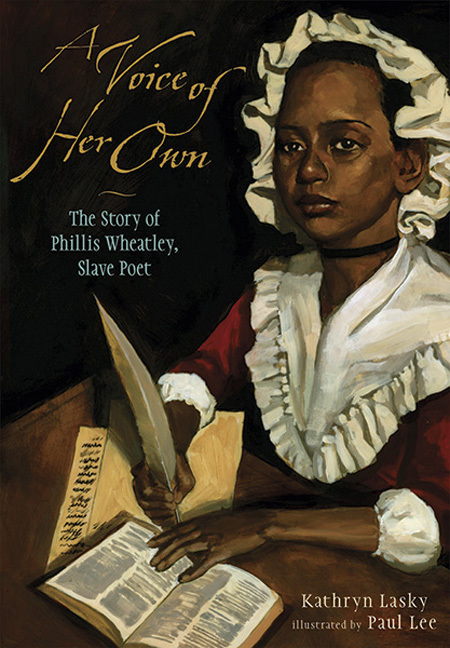 2) A Voice of Her Own; The Story of Phillis Wheatley, Slave Poet by Kathryn Lasky; ill. by Paul Lee (2003). Wheatley's story is miraculous in many ways. She was brought to the US on a slave ship, landing in Boston Harbor, at the age of about seven. John and Susannah Wheatley were at the market looking for a servant girl. Something about they way the young girl looked appealed to Mrs. Wheatley and they bought her, named her Phillis and took her home. Luck of the draw...because the Wheatley's treated her very fairly (within the mind warp that yes, they had indeed bought another human but in this instance it worked out well) Mrs. Sussanah Wheatly decided to experiment and taught Phillis how to read and write, which wasn't allowed in Southern states but was perfectly legit in Massuchusetts. Phillis impressed the Wheatley's with her ability to write and wanted her poems to be published in a book. John Hancock and other white American men said her book could not be published. The Wheatleys sent her to England and someone there agreed to publish it. Yes, Phillis found it odd as well that she would have to travel to King George's England to get her book published as she was a slave in the US. The American Revolution began soon after this. Lasky's book brilliantly brings to light the indignity that while Americans were willing to fight for their own freedom they owned other people. This is the backwards rationale we often still find in the United States. Great book, great message. Amazing woman. I wonder what she could have accomplished if she hadn't been kidnapped and brought to the States. We all agreed three years ago what a beautiful book this is, even the end papers, showing his poetry! This is just a great book about an boy who loved the outdoors and the sounds that surrounded him. In this book is the simple reason to read poetry to young people: "But when Mr. Abbott read poetry to Willie's English class, Willie did not feel hurried. The gentle sounds and shifting rhythms of the poems were like the music of the river. As the teacher read each line, Willie closed his eyes and let them make pictures in his mind." Proof that we need to keep reading poetry to spark one mind into a deep love of language. Who knows one of your students might be the next William Carlos Williams. Pick Up Some Poetry Today and share it with a child. Yesterday I had a crazy day but part of the craziness involved two different AMAZING Authors...Alan Katz aka Silly Dilly Man was at my school and Patrick Jennings was at the public library. I met both and fell in love...see the photos to prove it tomorrow or maybe, Sunday.